As I was planning my trip in the valley this week, I was printing of Google Maps to take me from my hotel to meetings and to the SES San Jose. I am staying at the Sheraton San Jose in Milpitas. The exact address is 1801 Barber Lane, Milpitas, CA, 95035, USA. When I was printing my iternary on Friday I did not really notice the placement of the icon on the map for the location of the hotel. Driving from the SFO on Sunday night to the hotel, I noticed the mistake. Here is the screenshot from Google Maps for this exact query “1801 Barber Ln, Milpitas, CA, 95035, USA” notice where Google plots the location, the yellow circle is where the location actually is. Click the images below to load the maps. I am sure that Google will be correcting the geo-code for this location once they see the image listed above. All in all, the inconvenience was not that bad, took me a few extra minutes, a few scratches on the forehead and my iPhone to get to the right location on Sunday night. Morale of the story : double-check your printed maps before leaving and verify using Satellite view (I would have noticed the mistake if I looked at Satellite view) – sometimes they may be a little off. This entry was posted in Bing Maps, Google Maps and tagged Bing Maps, Google Maps, sheraton, silicon valley on August 11, 2009 by Darby Sieben. Does Tweeting Drive Google Search Volume? Twitter has been all the rage lately getting lots of coverage by bloggers and traditional media outlets. I too have been active on Twitter @darbysieben as well as contributing to @yellowpages_ca. What I wanted to know is whether tweeting can actually drive Google search volume in the same way that traditional media campaigns can increase search volumes. My experiment is very limited in time and scope, so not scientific at all, however, I wanted to share my early results. What I did was set-up a Google Adwords campaign specifically for the exact match keyword “darby sieben”. On a side note, I encourage everybody I meet to do the following; a) register your own name as a domain name, and b) set-up a google alert on your name. I believe that personal reputation management will be a big trend in the next few years. Second, I added no new blog posts for the first 20-days of May, my online communication was limited to Twitter only. 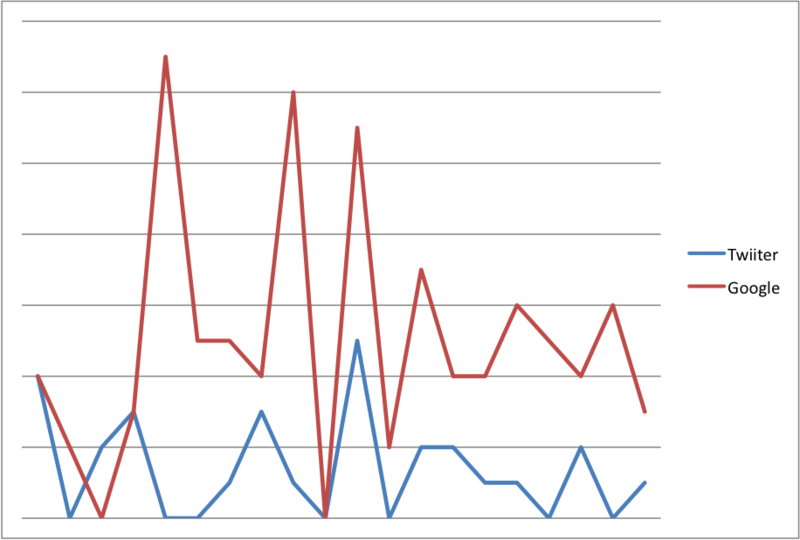 I have actually run my Google Adwords campaign on my name for some time and see a correlation between blog posts and the increase in ad impressions. So for my experiment, I did not want to introduce the variable of a blog post into the equation. Third, I tracked my posts on Twitter and the ad impression count through Google Adwords. Here is the chart for the first 20-days of May. It would appear that there is a correlation between Tweeting and increasing search volumes. That said, this experiment is too limited to make any concrete conclusions, but directionally would seem to make sense if I view Twitter in the same way as traditional media. What I believe this does demonstrate is that viewing search volumes alone is not sufficient in and of itself for measuring ROI, rather a more holistic view of what causes search volumes may be more of an indicator of what actually drives usage. This entry was posted in Google Adwords, Twitter and tagged Google Adwords, search volumes, Twitter on May 24, 2009 by Darby Sieben. 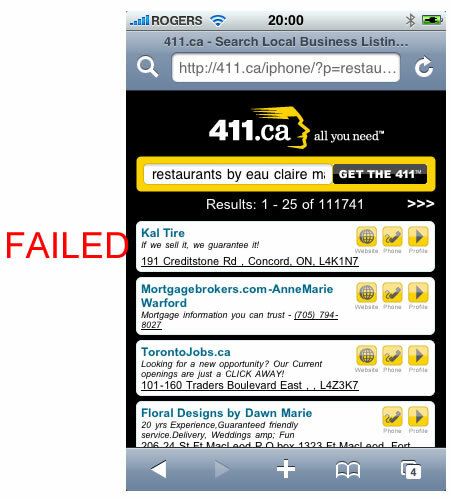 As the iPhone becomes more and more popular in Canada I decided to take a look at 4 local web products, YellowPages.ca, 411.ca, Canpages.ca, and Google Maps. I selected these as they all have iPhone compatible versions of their websites. Google Maps is a standard icon on the iPhone by default. For this particular test I decided to focus on a popular generic category search (dentists in Toronto) and a very specific landmark search (restaurants by Eau Claire Market). For those of you who don’t know, Eau Claire Market is a popular destination located in downtown Calgary. I believe that landmarks would be important search criteria for mobile products. In terms of ranking, I have decided not to rank the results. For the landmark search I indicated success or failure. You be the judge in terms of your personal preference. 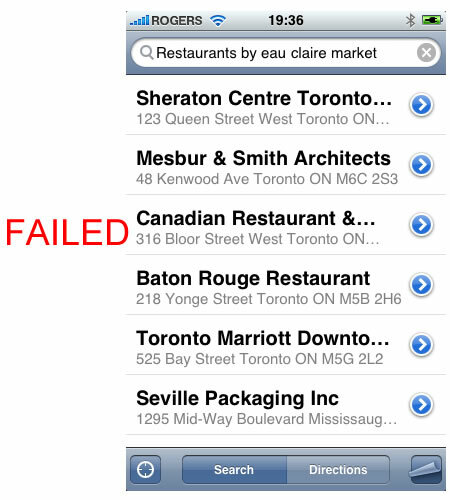 Please feel free to add a comment on your favorite or suggest other sites in Canada that have iPhone versions. Let’s start with what happens when you bookmark the websites above and put them on your iPhone desktop. Maps (Google) – this is default on your iPhone. One issue that I have is that Apple or Google have failed to customize this icon for regions – notice the US highway signage. 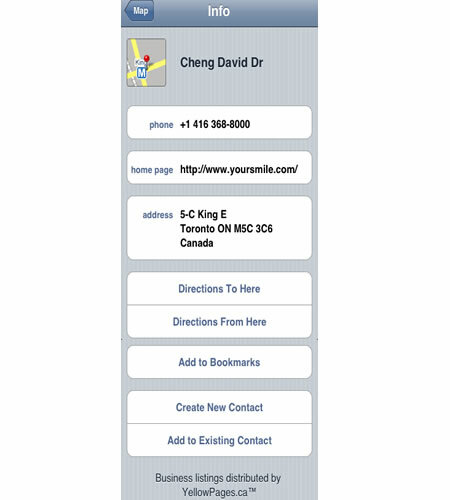 YellowPages.ca – In Canada, Yellow Pages(TM) is a registered trademark and when you bookmark you get the logo on your desktop. 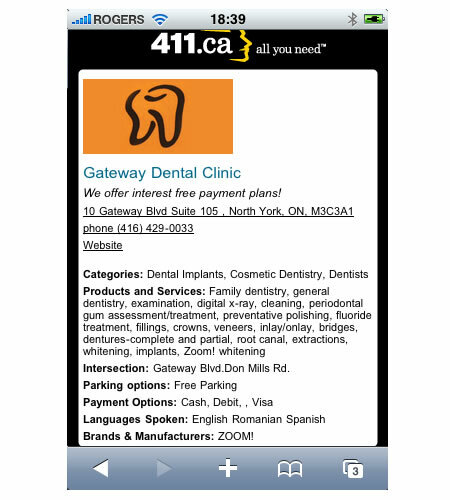 411.ca– They have a unique icon and tell you 411 at the beginning of the text string. The ouch! at the end is a little weird though. 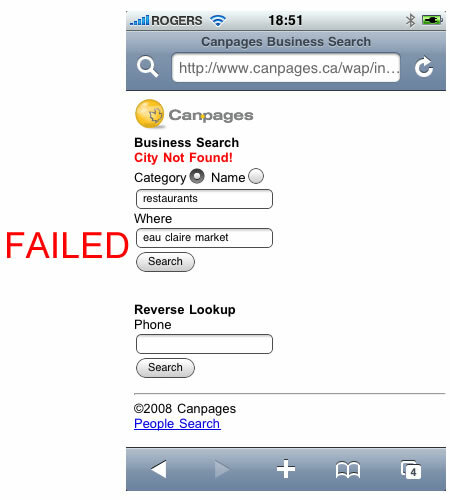 Canpages.ca – No custom icon, uses a screenshot that clearly tells the user nothing. Let’s look at each property individually based on my two search queries. 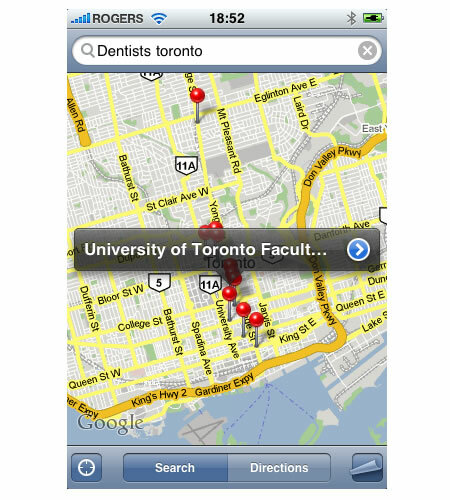 First we try Google Maps – “dentists in Toronto” search on Map view. The same search done via list view. Here is the screenshot of the details of the business listing. Finally we will conduct “restaurants by Eau Claire Market”. This search failed as the results are located in Toronto. Google did not recognize this landmark. 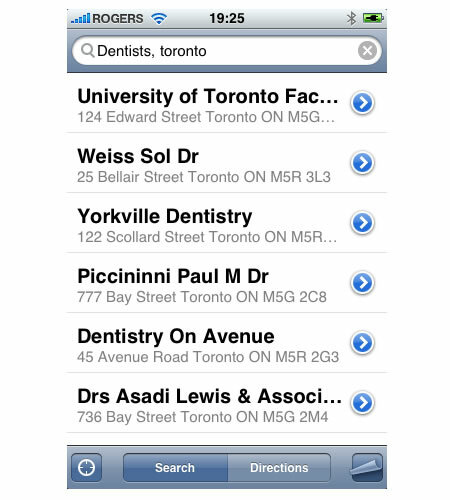 Second we try YellowPages.ca here is the screenshot for the “dentists in Toronto” search. 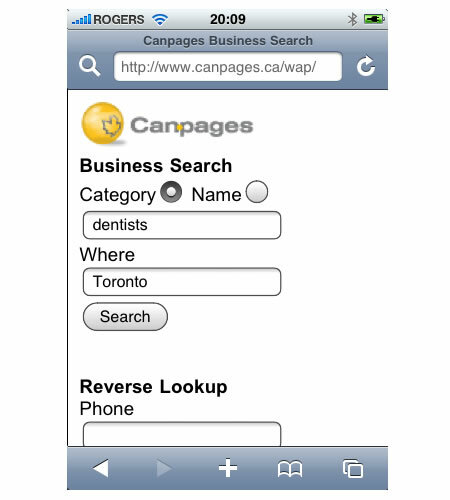 NOTICE: with YellowPages.ca you also have the ability to switch to find a person in Canada using Canada411.ca. Here are the results of this search. Finally we will conduct “restaurants by Eau Claire Market“. This search was a success, landmark was recognized. 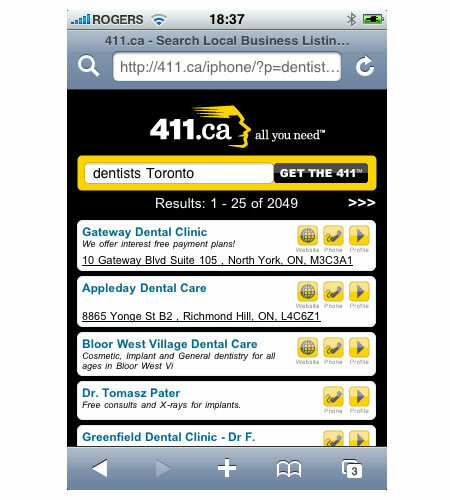 Third we try 411.ca here is the screenshot for the “dentists in Toronto” search. Finally we will conduct “restaurants by Eau Claire Market”. This search failed as the results are located in Ontario. 411.ca did not recognize this landmark. 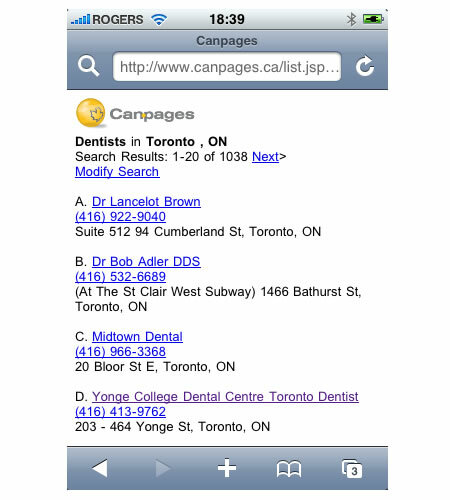 Fourth we try CanPages.ca here is the screenshot for the “dentists in Toronto” search. Finally we will conduct “restaurants by Eau Claire Market”. This search failed CanPages.ca did not recognize this landmark. If you want to see another comparison - check out Taking a Look at Local Merchant Pages in Canada - a post from last December. 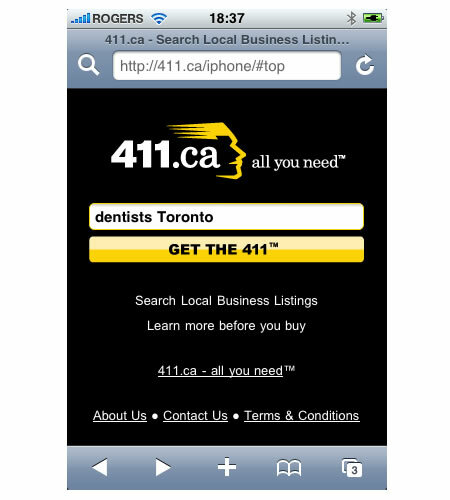 This entry was posted in 411.ca, CanPages.ca, Google Maps, iphone, Local, YellowPages.ca and tagged 411, apple, can pages, Google Maps, iphone, yellow pages on November 1, 2008 by Darby Sieben. In a posting done by Jeff Jarvis on December 30 titled “9 Remarkable Stats on Google“, Jeff did a very good job of highlighting some interesting stats on Google. I spent a lot of my time in 2007 working with a number of people from the Google organization in my role with Yellow Pages Group and for as much as we hear Google as the corporate entity, like every successful company in the world, it is the people behind the company that make it truly remarkable. This entry was posted in Google, Trends on January 2, 2008 by Darby Sieben. In discussions with small business owners, when asked, what method of tracking do you use to measure your new sales, the most common response is “I ask my consumers where they heard about me”. Usually the second part of the conversation goes this way – “word of mouth is my best form of advertising” and “I tried many forms of advertising, none have worked for me”. I am a very strong believer in WOM and the incredible growth it can generate. That being said, WOM often takes more credit away from supporting advertising vehicles, giving the impression to a SME that their advertising is not working. Bus Owner: Thanks for coming in. How did you happen to hear about our store? Bus Owner: Thanks for coming in. Can I ask you two questions about how you come to our store today? Bus Owner: How did you hear about out store? Bus Owner: Thanks, how did you get our address? Customer: From your website? From my friend? From the Yellow Pages? Bus Owner: That’s great, if you liked the service today, please tell your friends about us and have them visit my website, Yellow Pages ad, etc. for my store details. Of course the exact questions can be changed and tailored, but the main point is that in most cases WOM is supported by another medium that connects the buyer and the seller. People will refer people they like to people they trust, however, those same people will usually not know all the details about your business. WOM can accelerate your sales when you have a support mechanism behind it and you incorporate it into your WOM strategy. Continuing with the example above and examining customers who indicated they used the Internet to find your address, we need to examine our web analytics. The first question I usually get is, should I ask customers how they found me on the web? I advise against asking any questions about how people found you on the web. The reason is that there is a lot of confusion among web users – so the typical response is Google – even if they used MSN, Yahoo or something else. This gives the illusion that all web traffic is generated from Google – which is not the case. As a business owner, if you have a good analytics package – all you need to know from your customers is whether they saw your website. Once you have a in-store count you can cross-reference this with your web analytics to find out what is and is not working online. As a side-note I want to share a quick story. I helped a auto dealer in Calgary with their tracking and customer acquisition strategies. Calgary has two major newspaper dailies – the Calgary Herald and the Calgary Sun. We started by creating a baseline, by spending one month asking customers how they came to stop by the dealership. Of the two newspaper dailies what we found was that 25% came from paper 1 and 15% came from paper 2. Here is where it gets interesting – this particular dealership had not advertised in paper 2 for a couple of years, yet 15% of new customers said they found the dealership there. Here is my take on this non-scientific survey – when asked, some customers will simply answer what comes to their mind first as opposed to what is actual. Not because they are dishonest, just that they most likely don’t care and will answer to shut you up. The same thing is happening on the web – I bet I could take 10 people who use Yahoo Search as their primary engine and half of them, when asked quickly, would probably say Google. My point is that only relying on asking people how they found you on the web can be misleading, whereas this potential misleading information does not exist with web analytics. Here are some stats from my mom’s business, The Bra Lady. What we have learned over the past 4-years of tracking results is that WOM is by far her #1 way of generating new business with the Internet as her primary support mechanism to WOM. What we have also found is that many people are referred to her business, but use search engines and directories to find her web address. Probably 80% of her new clients indicate that Internet played a role. NOTE: this may be high and in her particular situation makes a lot of sense – because she is a home based business. However, when I worked with Auto Dealers – this number was about the same and dentists were up there as well. On a monthly basis we compare the number of referrals who indicate the Internet was a source of them finding her to her actual analytics – we use Google Analytics to understand better exactly how these people ending up finding her. 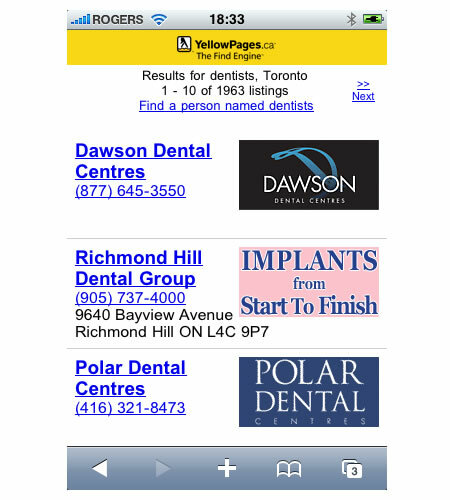 In the above you will notice that the top three referrers of traffic are Google, YellowPages.ca, and Direct. Examining just the top three referrers, typically I would examine further both the traffic from YellowPages.ca and Google. What I notice is the majority of keywords from Google are good quality. You will notice that keyword #20 – the one that references ebay is not considered a good keyword, however, this is the nature of search engines. It is important when examining search engine traffic to look at the keywords to get a accurate picture. The conclusion is that Google is generating good traffic. What I notice is that the top referring URL from yellowpages.ca is the merchant page that was built for her business by YPG – this is good – it supports the decision to have the website URL located on this page. 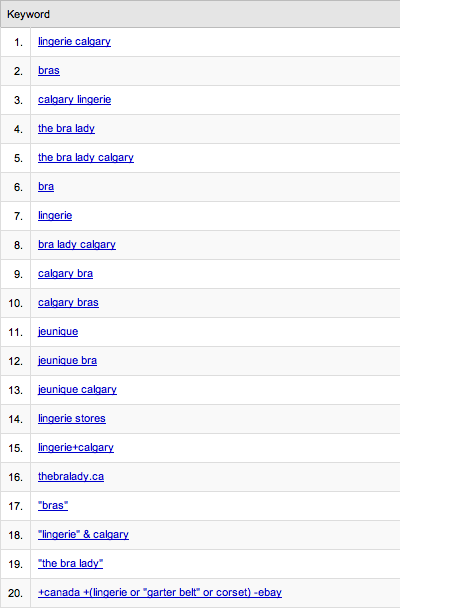 If I continue to examine further I see that users were searching using keywords we anticipated and specifically in Calgary. What I like about directory traffic is that people don’t surf directories. They go there for a purpose – usually to find something in particular – so the traffic generated here is high-quality. 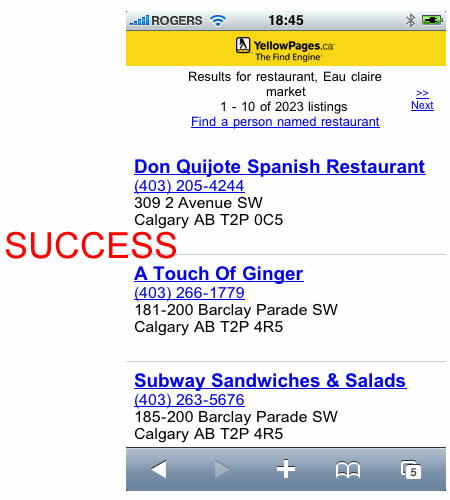 You will notice that we are also showing other top referrers in Facebook and CalgaryPlus.ca. I did a posting back in July of this year – Facebook – Can Local Business Florish in Social Networking? and its potential impact on local business – watch for this. For those of you interested – here is an article I posted back in 2005 on the strength of media companies and front-page placement – Power of Front Page Placement. In conclusion – I would challenge any SME to dig a little deeper in 2008 in terms of their tracking and understanding of customers. Also I would encourage you to not presuppose answers as to where online traffic might come from. In Canada – we are continually bombarded with US news and information about the Internet, which sometimes gives us a US perspective on traffic as opposed to a CDN perspective on traffic. Build your measurement criteria, find the tools to track and examine them monthly – this will generate great results for your business in 2008. 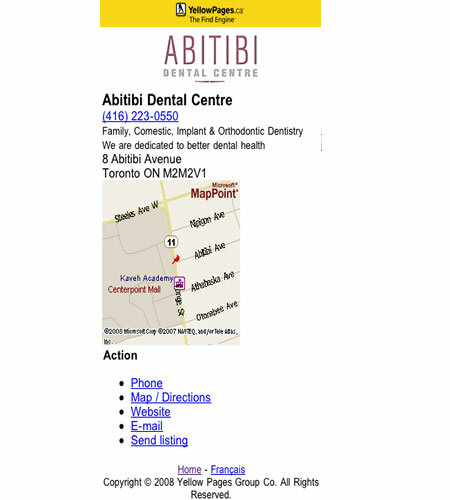 This entry was posted in Directory and Yellow Pages Advertising, Google Adwords, Local, Trends, Word of Mouth, YP and Local Search on January 1, 2008 by Darby Sieben.